Located in Huatulco, Hotel Plaza Conejo is within a 15-minute drive of Chahue Beach and Huatulco Beach. Featured amenities include a 24-hour front desk, multilingual staff, and luggage storage. With a stay at Enjoy Playa Hostel in Playa del Carmen (Centro), you'll be steps from Quinta Avenida and Yucatek Divers. Featured amenities include a 24-hour front desk and luggage storage. 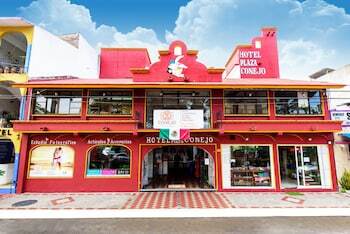 With a stay at this hostel in Cozumel, you'll be within a 5-minute walk of San Miguel Church and Benito Juarez Park. The front desk is staffed during limited hours. With a stay at Rancho Viejo in Temascaltepec de Gonzalez, you'll be 11.2 mi (18.1 km) from Monarch Butterfly Sanctuary and 11.3 mi (18.2 km) from Nevado de Toluca National Park. When you stay at Bellavista Cabanas in Mazamitla, you'll be within a 10-minute drive of Mazamitla Temple and Mazamitla Plaza. Free self parking is available onsite.